Mondomarine superyacht Ipanema is one of the most eye-catching launches of the year so far, with her radical hull colour making headlines across the world. But as these new pictures of her Hot Lab designed interiors reveal, this 49 metre yacht is just as striking on the inside. 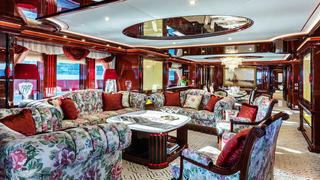 Stepping inside Ipanema is a feast for the senses, with her lavish saloon featuring floral armchairs, mirrored ceiling panels and high-gloss mahogany woodwork throughout. Mondomarine superyacht Ipanema is one of the most eye-catching launches of the year so far, with her radical hull colour making headlines across the world. But as these new pictures of her Hot Lab designed interiors reveal, this 49 metre yacht is just as striking on the inside. 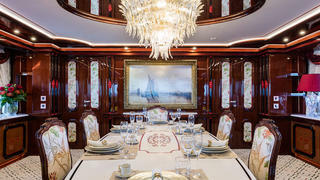 Stepping inside Ipanema is a feast for the senses, with her lavish saloon featuring floral armchairs, mirrored ceiling panels and high-gloss mahogany woodwork throughout. Full height main-deck windows mean that plenty of natural light floods into this area, illuminating the finely appointed dining area with its crystal chandelier and gently curved marble table. More than a dozen types of marble were used on board Ipanema, including white onyx and ming green, with 37 motifs created to differentiate between the key areas on board. Full height main-deck windows mean that plenty of natural light floods into this area, illuminating the finely appointed dining area with its crystal chandelier and gently curved marble table. More than a dozen types of marble were used on board Ipanema, including white onyx and ming green, with 37 motifs created to differentiate between the key areas on board. Moving to the upper deck of Ipanema, and the atmosphere is more relaxed, with the light blue tones reflecting the yacht’s nautical surroundings, which can be viewed through the large windows. The classical styling is consistent with the rest of the yacht, however, as the columns, pilasters, carved lintels and bas-reliefs draw on Italian, English and French architectural traditions. 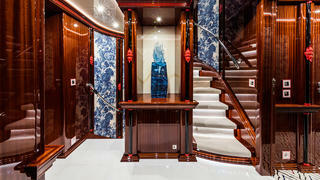 All of the furniture on board Ipenema was custom made by TeT and Arredaitalia. Ipanema’s superyacht staircase is a work of art in its own right, with elegant curves and floral wall panels catching the eye. 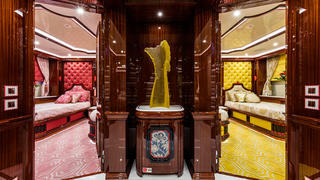 The red sculptural motif on the pillars is repeated 161 times throughout the yacht. 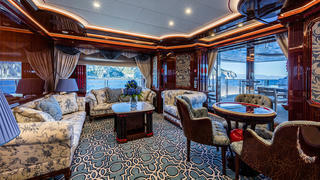 This is one of many areas on the yacht to benefit from all-wool moquette carpets, which were made to a bespoke design that was created by Hot Lab. Each guest cabin on Ipanema is a unique creation, with its own colour scheme and bespoke linen by Rubelli and Sanderson. This stunning image shows the port bow guest cabin with its vivid raspberry and ivory design, as well as the starboard bow guest cabin, which features warm yellow and gold tones. Ipanema can accommodate a total of 12 guests, with a main-deck owner's cabin and pullman berths fitted to each of the two twin cabins. All of these elements come together in Ipanema’s spectacular master cabin, which is situated on the main deck and makes the most of the yacht’s nine metre beam.